There are a lot of traditions that make up the Christmas season in Ireland. Some are simply an Irish approach to an international practice, while others are definitely only-in-Ireland phenomena. Christmas doesn’t start until kids stay up late to watch The Late Late Toy Show. The Late Late Show is Ireland’s oldest chat show, and at the start of every December since Gaybo was a boy they’ve devoted one show to featuring favorite and new toys. The show is hilarious as the adult host, currently Ryan Tubridy, has to deal with dozens of young children who review the various toys (some as young as five), going off-script constantly and ad-libbing to great effect. 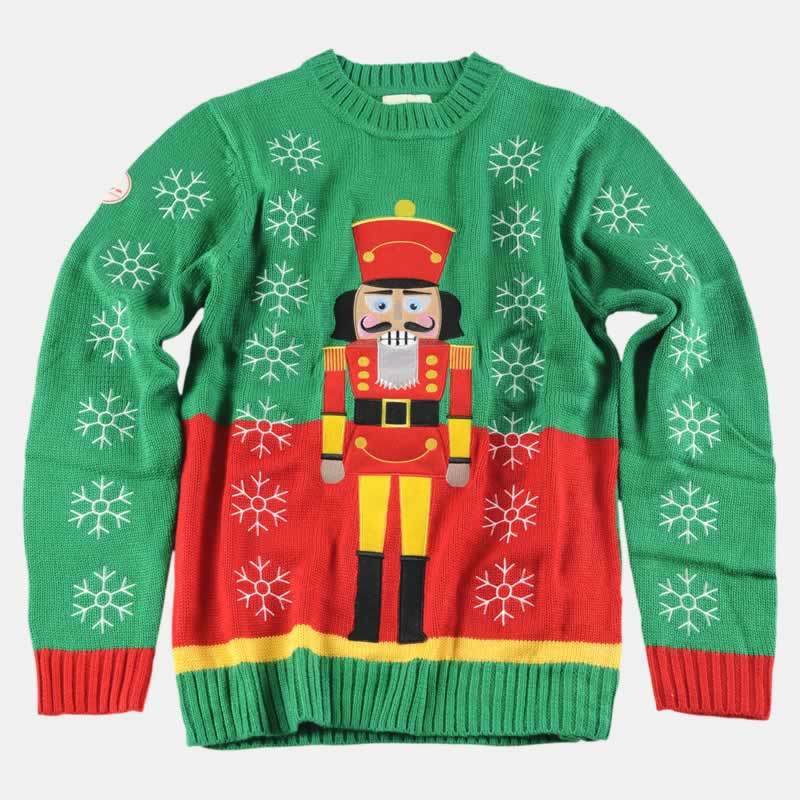 Ryan usually wears that other Christmas staple the ugly Christmas Jumper, and frequently breaks the toys, drawing pained comments from the kids. Now that social media has taken off, following the Twitter chat as the program airs is essential. Viewers worldwide can watch this year’s Toy Show online for a few more days. If you visit anyone over the holidays, you bring a tin of biscuits or a bottle of something (or both, if the old employment situation is good). Tins of biscuits are something you only see at Christmas, and there are no plain biscuits in the box! Few Irish are born without a very sweet tooth! Thankfully, tins of biscuits are easier to come by in the US these days. Don’t show up at any Irish Crimbo party without one under your arm! St. Stephen’s Day (aka Boxing Day) is the traditional day to go visiting, as Christmas Day itself is reserved for family — although, there is a lot of visiting done all throughout the holidays. When I was small, our best friends always came over on Stephen’s Day, and we’d eat biscuits until we got sick. The church I went to as a child devoted one of the Sundays in the run-up to Christmas to the annual carol service. The volume an entire congregation can produce when they sing something everyone actually knows can be amazing! Christmas crackers are cardboard tubes covered with colorful paper, and containing a paper crown, a tiny toy, and a joke. There’s also a banger, a piece of paper that cracks loudly when pulled apart, hence the name. Two people each hold an end of the cracker and pull. The cracker splits apart with a bang, and if you didn’t win, don’t worry, Mammy has boxes of them in the spare room. The start of the Christmas decorating in our house always involved a walk in the woods with pair of clippers to cut armloads of holly (with red berries). We’d wear several layers of long-sleeved coats to carry the holy back without getting our arms pin-cushioned. Back home, the holly sprigs would be taped up above all the doorwarys for luck. Mistletoe was rarely ever seen. Whether you’re Protestant or Catholic, there will be a service in your church at midnight on Christmas Eve. If you’re lucky, it’ll be a candlelit service — although be careful you don’t set you own long hair (or somebody else’s) alight. This is one of the two services all year that bring out everyone — and I mean everyone — in the parish, so show up early or you’ll be standing at the back. And yes, it is a fashion show, so dress up to the nines. Groups of singers like to visit hospitals and children’s homes, or sing carols in the center of town while collecting money for charity. Just like in Great Britain, caroling around the streets of the town is a long established Christmas tradition in many communities. The highlight of the school year for national (elementary) school students is the nativity play that retells the Christmas story. The kids are always excited about who will get cast as Mary, Joseph or one of the three kings? Or, will it be another year in the angelic choir chorus or the merry band of shepherds? Since being recorded in 1987, this duet between The Pogues and the late Kirsty MacColl has become the favorite Christmas song in Ireland and the UK. It regularly appears back in the pop charts on the strength of seasonal downloads, and is never off the radio throughout December. Last thing on Christmas Eve, kids set out a plate of biscuits and a glass of whiskey for Santy (as he’s known to his friends). It’s cold out there, and I expect even more-so when you’re flying around on a sleigh, so my father always said whiskey would be far more warming than milk. I’ve taught my kids to leave whiskey out for Santa, even though we spend many Christmases in America, where Santa seems to only expect milk and cookies — perhaps as a means to settle his stomach after going around Ireland? Many families place a lit candle in the window at night on Christmas Eve to symbolize a welcome for the Holy family. It’s perhaps more of a Catholic tradition, but like many Christmas traditions, it’s one that is beginning to have a life apart from its religious origins. The Irish wish each other a Happy Christmas, never a Merry one. This was originally a Scandinavian tradition, where a Christmas tree was burned to heat the house for Christmas merriment. This gradually morphed into the practice where a log from last year’s Christmas tree is saved to be burned at sunset on Christmas Eve to mark the beginning of the big day. This may be more of a tradition among Protestant families in Ireland. Anyway, as many modern houses heat with a gas fire or radiators instead of having an open fireplace, some families simply drill some holes in a log and place candles in these to symbolically “burn” the log. 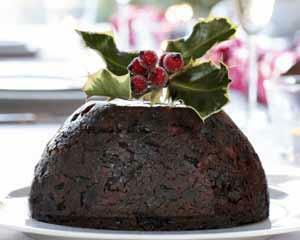 The traditional desert served after Christmas dinner, a plum pudding is basically a fruitcake cooked in a pudding bowl with gallons of alcohol added. Everyone’s usually too full after the traditional turkey and ham dinner, so the pudding may be served a little later, in front of the fire while the family watches the Doctor Who Christmas Special or some favorite Christmas film. Whiskey is poured on top and set on fire as it’s served, for maximum impact. Only the hardiest go for a swim on Christmas morning, the rest of us shudder in solidarity when we watch the inevitable report on the six o’clock news. The 40 Foot is the famous bathing spot in Dublin Bay — most famous for skinny dipping! — but the brave Christmas swimmers usually cling to anything that might keep them a little warmer, and at least one person goes in wearing the full Santa suit! If you’re not staying home to visit on Stephen’s Day, you may join the throng at Leopardstown Race Course in Dublin for the traditional St. Stephen’s Day races. Don’t worry if you can’t break any longstanding family engagements, however, the Christmas race meeting at Leopardstown actually lasts four days, so you have ample opportunity to enjoy the racing — and the hospitality tent! With all that Christmas cheer, we feel luckier than usual — not that we ever need much incentive to gamble! It wouldn’t be Christmas without making fervent declarations that we’ll never touch another drop, back another horse, or eat another chocolate biscuit on New Year’s Day. And who knows, those promises might actually last until Little Christmas, when they can be safely forgotten, as just another annual holiday tradition. January 6th is the twelfth day of Christmas, and the traditional deadline for taking down the Christmas decorations. It’s called Nollaig na mBan/Women’s Christmas because it was a chance for women to put their feet up and relax after all the work involved in the holiday season — Irish men not being known for helping out very much in the kitchen. It was, and is, a chance for women to get-together and have a relaxing natter, although I’m not sure it’s anything like the holiday from housework that some rose-colored accounts on the Internet make out. Those are the highlights of the Christmas season in Ireland. There are surely some regional and other traditions I’ve omitted due to their being outside my own experience. Please leave a comment if there’s anything about Christmas in your corner of Ireland that you’d like to share. Dear Rich, Laughed at recollecting so much that is familiar … left Ireland at age 11 but of course the traditions lived on in our household as we remarked at how nobody else was “doing it right”. In my own household all over Europe and Africa, Santy would find a glass of whiskey and not milk. Yes, friends get a kick out of Christmas at our house. We’ve introduced Christmas crackers, plum puddings and Cadbury’s Roses to all out friends. Hmm, how about how we all crush into the pub before and after Christmas day, and panic that we can’t buy booze on the day itself and make sure to stock up (overstock)? I think it’s traditionally a log from last year’s tree, but I confess our family used the same log with holes drilling in it for the candles year in, year out. Nowadays, I try to save a log from last year’s tree (but we’ve still got a “yule log” one of the kids made in school at some point on standby, just in case. I discovered “Fairytale of New York” while shopping on Grafton and Henry Streets throughout Christmas during the year I lived there in 2001-02 and now, it isn’t Christmas until I play that song!